If you lose your device, Google lets you secure it instantly from afar through Android Device Manager, that let you locate and remotely wipe your phones and tablets. 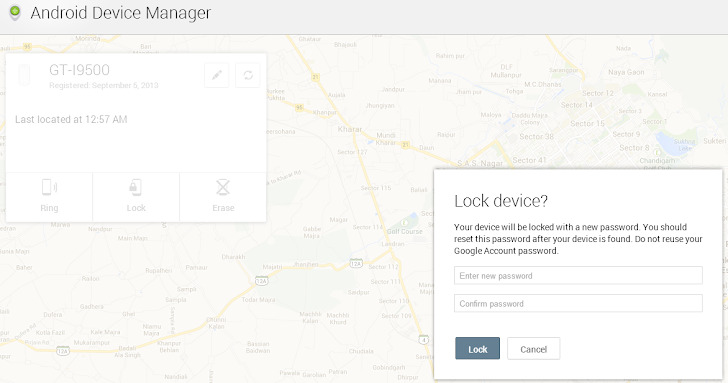 The latest update to Android Device Manager enables remote password locking, overrides the built-in Pattern, PIN code, Face unlock or password-based security, making sure your data doesn’t fall into wrong hands. To get started, go to google.com/android/devicemanager on your computer and go through your list of devices that are connected to your Google account. I tried the process with my Samsung Galaxy S4, and it worked like a charm. Google’s new feature is a very useful one for those who don’t have a lock on their phone and want to make sure their data is protected. A lock request will immediately secure any device connected to Wi-Fi or a cellular network, even if it's actively being used. If a thief has turned off a phone or enabled Airplane Mode, the lock will take effect as soon as a data connection is reestablished. You can hit the Ring button, making your Android device ring at the maximum volume, even if it is on silent, so you can figure out where your phone is. Are you already using Android Device Manager for your Android phone? What are your thoughts on this new remote lock feature that is now available? We always appreciate your comments.